I love mochi–in soup, filled with sweet beans in daifuku form, or toasted, dipped in soy sauce and sugar and wrapped in nori. Growing up, though, I was actually scared of it. Every New Year’s Day, my mom would make ozoni, Japanese mochi soup, and every year she would warn us kids to eat it slowly–because if we didn’t we would choke and maybe die! I guess I can see how it could happen–it’s really sticky and when added to soup, it becomes kind of thick and hard to swallow. It’s like when you buy bubble tea; the label always includes some “use caution when swallowing” warning because you don’t want one of those little tapioca pearls getting stuck in your throat. 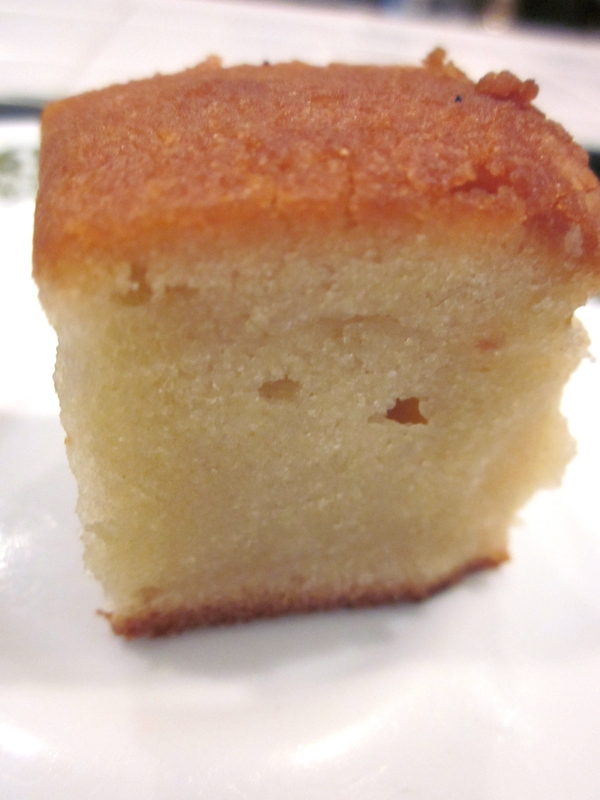 When I heard about mochi cake for the first time, I was really excited by the idea! And when I tried it for the first time, oddly enough in Lima, I couldn’t stop eating it, it was that good. Since then, I’ve been dying to make it myself. Yesterday, I finally had the time. The recipe I found on Week of Menus couldn’t have been simpler. (You don’t even have to think ahead to take the butter out to warm to room temperature—something I always forget to do.) Whisk, whisk, pour, bake and serve. Love that. So what did I think? It was perfectly moist and had this amazing chewy texture—via the rice flour—and yet, something was missing: the coconut? I poured two whole cans (28 oz) of coconut milk in there, but I couldn’t actually taste any coconut flavor in the finished product. Where’d it go?? In all honestly, I made this because a) I’m crazy for mochi and b) I’m even more coo-coo for coconut. What a let down that was. So I’m a bit disappointed, not necessarily in the recipe (I made one 9×13 panful yesterday and they are already all gone—a sign that they must be good), but in myself. Because I didn’t love this as much as I hoped I would. I think it was the coconut. Next time, I’ll maybe add flaked coconut or maybe coconut essence to up the flavor. I might also try using evaporated or condensed milk too. In a large mixing bowl, whisk together mochiko flour, sugar, baking powder, and salt. Pour batter into greased 9X13 pan. Carefully smooth out the top. 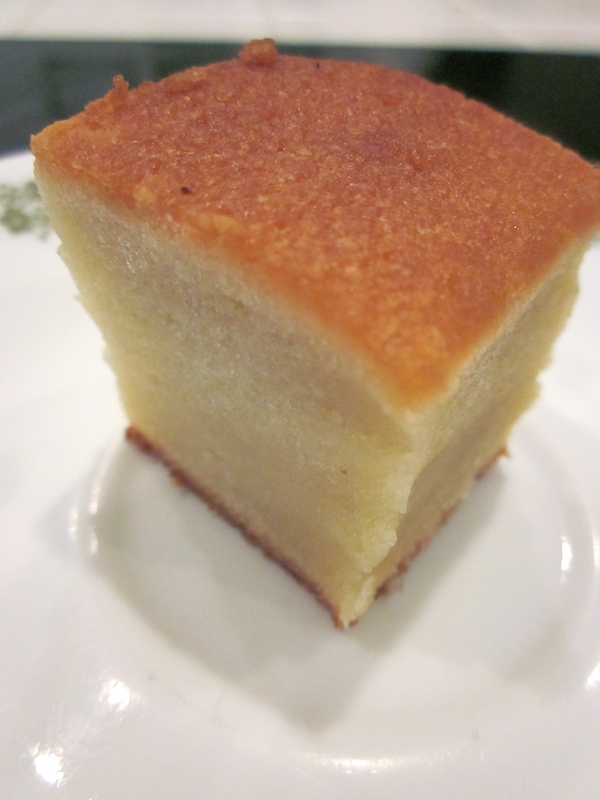 Bake for 90 minutes, until top is golden brown and the cake begins to pull away from the sides of the pan.